More specifically, Rob asks if it would be possible to commercialize instructional practice (a new idea), as opposed to commercializing instructional content (the traditional publisher role). One possibility would be assessment tools, including adaptive assessment; we've seen a lot of that (machine-graded testing: ugh). Rob also considers the idea of commercial social learning networks, and that IMO is the really crucial question. I have seen no real evidence of that from either publishers or from the mainstream LMS world; it's just more bad discussion board software again and again, without anything like the personal/social stream which is the sine qua non of real social networks. Presence + agency = network. To my way of thinking, it is instructor presence and student presence that combine through purposeful agency to create what I would call personal learning. The network is able to amplify and coordinate instructor and student presence, making us all more present to one another as co-learners who are sharing together. Content thus becomes a natural product of the network: content is what we share with each other, and as content moves throughout that network from person to person, the content itself becomes personalized. That's how I see the learning network: it runs on both agency and presence, with content being both consumed and produced by the people who share in that network. Personal streams. So, this is why I consider the personal stream to be the fundamental online element we should be looking for in any kind of learning approach (including anything that claims to be a learning management system). The personal stream should be the place where people (students and instructors alike) keep track of what they are learning, documenting their choices and their learning, reflecting on those outcomes, and also sharing what they've learned with others. Put all those personal streams together, and real learning networks will emerge with all the power of sharing and amplification that networks allow. Yet education still doesn't get social networks, even though we've had Facebook since 2004, YouTube since 2005, and Twitter since 2006. The social networking software system called Ning DID get it (remember Ning? ), and I have to credit Ning for my own transformation as a teacher: it was using Ning for my classes instead of an LMS that I finally figured out what I wanted my classes to be, and that was back in 2007. So, that's where I look first: show me where the personal stream is going to happen in a course design or in the design of a learning product. Then I'm just not interested. And the absence of a personal stream in the Canvas LMS that my school is about to adopt is why I am just not all that interested in what Canvas offers; to my way of thinking, it is not really anything new (more on that here). And now: carry on the conversation! This is all important stuff, so please blog, comment, anywhere, everywhere: I'm not sure if we can take back personalized learning from the commercial hypesters, but we can try. And please chime in if you want at our #OpenTeachingOU / #OpenOK chat on Friday March 25 chat on personalized learning; find out more here. 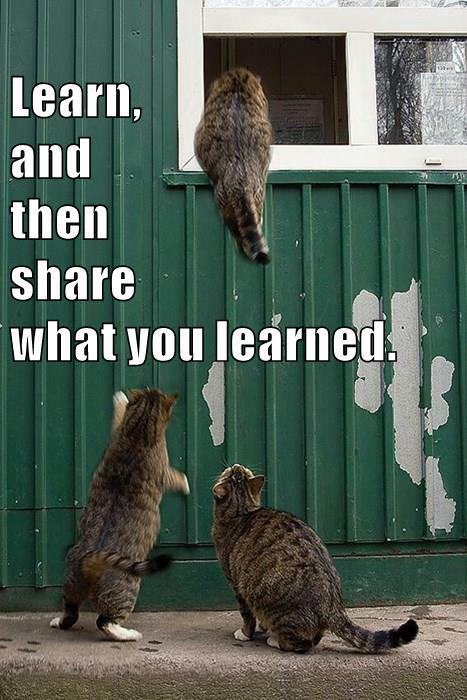 Meanwhile, as you can see, the growth mindset cats get it... so, Happy #Caturday AND Happy Learning, everybody! Learn, and then share what you learned.